The Hampton Carousel is reopening for the season! Come out and enjoy a ride on this historic carousel for just $1. Built in 1920, the carousel is completely restored to its original beauty and housed in its own weather-protected pavilion at Carousel Park on the city’s downtown waterfront. 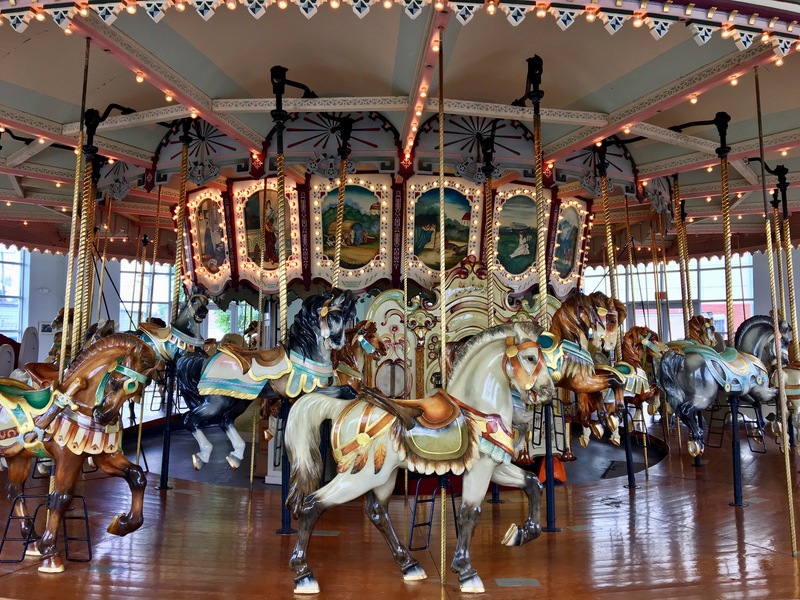 It is one of only 170 antique wooden merry-go-rounds still existing in the U.S. Hand crafted by the Philadelphia Toboggan Company for the Buckroe Beach Amusement Park, Hampton’s Carousel is a whirling tribute to the skill of its creators. After untold numbers of young and old enjoyed the carousel over its 65-year tenure, it was put in storage with the closure of Buckroe Beach Amusement Park in the mid-1980s. It was moved and restored at its current location in Carousel Park on Settlers Landing Road in Downtown Hampton in 1991. It still boasts its original mirrors and oil paintings, as well as 48 intricately decorated horses. Rising and falling to the strains of the original band organ, many of these carousel horses are so finely carved that the veins in their necks and legs are visible. Special hours are available for groups or special occasions. The carousel will close for the winter on December 29, 2019, and reopen in April 2020.